You are currently browsing the The Indie Credential weblog archives for February, 2008. Back in November or so I bought a pair of Duffy tickets for a gig at the Ruby Lounge on the back of “Rockferry” which I’d had the privilege of having about 18 months to get to really love. Subsequently she performed on Jools Holland and was, shall we say, unimpressive – not because she doesn’t have a great voice, but because the songs were such bland soul-by-numbers tripe. The Ledge immediately said he was not going to watch Duffy as he’d been iffy on the idea anyway. I still thought there was hope, I mean if she has one song the calibre of “Rockferry” then perhaps there were more. Of course, then I noticed that Rogue Wave were opening for Nada Surf. That did it. Despite only knowing one Nada Surf song – their MTV novelty hit from around 1996 called “Popular” – I told The Ledge I’d put the Duffy tickets up for sale at Scarlet Mist and we could go see Rogue Wave, who had left us both gutted when they’d cancelled their previous (and only) tour date here in Manchester, leaving us wondering if they’d ever make it to the UK. So, I, at least, was excited to finally get to see Zach Rogue and band as their second album, Descended Like Vultures, never fails to make me smile through the soft, lilting harmonies and Shins-esque guitar lines. 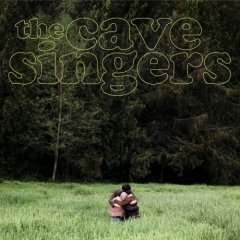 The first album isn’t bad either, although it is a bit more naive and simplistic. In any case, we got to the venue early and a small group of people were already clustered near the stage, at least one of them in a Rogue Wave T-shirt purchased from the merchandise stand. While The Ledge was queuing at the bar I made my way forward where a very nice bloke noticed me behind him contemplating where my best view would be and kindly moved behind his friend so I could get close enough to see the stage. By the time Rogue Wave emerged on stage there was a reasonable crowd, and the number of people singing along and the sheer volume of the shouting suggested that quite a few people had done the same thing we had – come down to see the opener. While the sound was the usual muddy mess that you get in Club Academy most nights, the band were on good form and much louder and rockier live than on record. Like many slightly twee acts, they bolstered the sound a bit live to make it louder and noisier so that it would fill the room a bit more, and it worked, for the most part. I was fascinated with bassist Patrick Abernethy’s upside down bass – he’s left-handed so he’s restrung it rather than buy a left-handed bass. The short, 30-minute set consisted of about half new songs from an album that has yet to be released here in the UK (and which, sadly, was not on sale on the night) and older material. 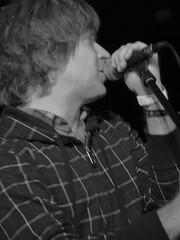 We were chuffed to hear “Publish My Love,” “Bird on a Wire” and the standout track from the first album, “Every Moment.” For much of the growing crowd, the highlight appeared to be the appearance of Nada Surf’s lead singer, Matthew Caws, to sing on one of the new songs. For me, though, the highlight was “Bird on a Wire” descending madly into everybody on drums and percussion, including Nada Surf’s drummer, Ira Elliot. Only 7 short songs later and with the promise they’d be back in May, Rogue Wave departed all too quickly. After Rogue Wave, The Ledge and I debated whether we should move back and let somebody more familiar with the band’s back catalogue to the front or whether my being able to actually see the gig would alter my perception that much. We decided to stay put, at least for a little while, as staring at people’s backs and getting jostled by people going to and from the bar never makes for much fun, and I am glad we did stay where I could see. As for Nada Surf, I expected late-90’s-style American college drone rock, but they were far poppier and perkier than that and were actually pretty upbeat, chatting between songs to a crowd that (mostly) knew every note. They are, quite simply, probably a great example of the classic American indie-pop, college-radio-friendly band of the sort that I remember from my university days back in Boston, before that short period where everything sounded like Stone Tool Pearl Garden in Chains, and their sound certainly blended well with the live version of Rogue Wave. While the one song I knew I knew unsurprisingly did not make the set, I did recognise at least one other, a love song that The Ledge reckons was probably used in a film or TV show as he recognised it as well. The band chatted with the crowd and were pretty entertaining, but the set was very long – running towards two hours – and by the time they left the stage the first time, both The Ledge and I were exhausted and felt we’d had enough as listening to a band with whom you’re unfamiliar for that long becomes more of a chore than a pleasure, so we abandoned the gig and headed off for some food. Overall though, I was pleasantly surprised to learn that Nada Surf are more substantial than “Popular” and probably worth further exploration. File under cancelled shows,Gig Reviews,gigs,mp3,nada surf,Reviews,rogue wave. A couple of years ago we blogged a bit about a local band called Nephew. We saw them live a few times and they were great, and they also released an EP called Our Cold War which was very good indeed. 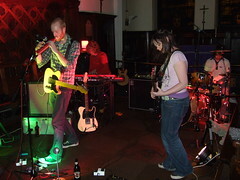 It all went a bit quiet on the Nephew front last year but they have now re-emerged as the much more Google-friendly Light Syndicate and last week played in the ornate but cosy surroundings of Salford’s Sacred Trinity Church. First to take the stage on the night was local singer-songwriter Simon Connor who did a decent job and managed to keep most of the assembled throng interested in his folksy pop. 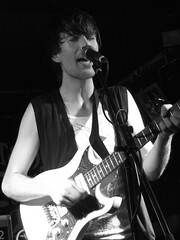 It was above-average singer-songwriter fare and his guitar playing was excellent throughout. He even busted out the ubiquitous looping pedal on his final song, building up layer upon layer of guitar to quite brilliant effect. The Bangs were a pleasant surprise, not least because their rather unimaginative name conjured up the image of a bunch of ladrock dullards. 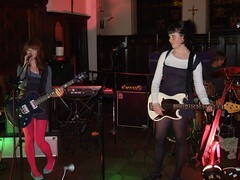 Things could not have been further from the truth as The Bangs are a three piece with a bloke on drums and a couple of very cool and slightly nervous looking young girls in their indie best sharing guitar, bass and vocal duties. And they were great, mixing up indie pop with grungey rock and taking me back to the early 90s and the likes of The Breeders and Throwing Muses, as well as some of those Riot Grrrl bands. Despite these influences, they were clearly intent on doing their own thing and were obviously enjoying themselves. What really impressed me was the way they used their guitars, picking out melodies on both guitar and bass that dovetailed together quite beautifully. We’ll definitely be watching out for The Bangs in the future; they could go on to break a thousand indie boy hearts. 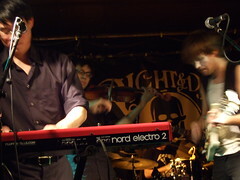 Light Syndicate have lost their violinist since last we saw them and so are down to a mean, lean four piece. This is a shame because he brought a lot to their sound, especially to the post-rock aspect of it, although without him they sound more compact and more focused. They have finished recording their long-awaited (by us, anyway) debut album and almost all of the night’s set was taken up by tracks from it. The church, with its high ceilings, chandeliers and huge stained-glass windows, was a great setting for their atmospheric rock. New songs like “Friday Night On Peter St.” and “87654” might betray an obvious Radiohead influence but they sounded excellent nonetheless. Old favourite “High Rise Buildings” from their EP (and re-recorded for the new album) sounded as good as ever with the missing violinist’s parts remaining intact thanks to the wonders of modern technology. 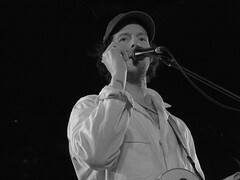 The album’s title track, “Last In Line”, was the highlight of a fine set with its blissful instrumental coda, complete with melodica solo, filling every corner of the room. They ended with a new song, “Super Tuesday”, which had a rather funky bassline and another lengthy instrumental coda that took the song well past the 10 minute mark. It is during these long instrumental sections that the band’s excellent rhythm section come into their own, laying down a solid groove and allowing guitar and keyboards the freedom to soar into the sonic heavens. 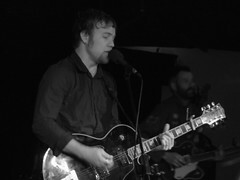 This was an impressive return to action and Light Syndicate have got a few more gigs lined up in the near future; check out their MySpace page for further details. 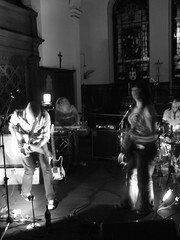 File under Gig Reviews,light syndicate,mp3,nephew,sacred trinity church,salford,simon connor,the bangs. I can’t say I’ve taken much notice of Bob Mould’s career since Hüsker Dü went their separate ways back in 1987. I never really liked his post-Hüskers band, Sugar, despite the fact that they seemed to enjoy much more success in indie quarters than their hugely influential predecessors, and, because of this, I never felt obliged to dabble in his solo work. 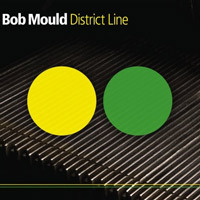 District Line is apparently a move back to the guitar-based indie rock that made his name back in the 80s and early 90s, after a couple of forays into techno territory. To these ears it certainly sounds very familiar. Solid opener “Stupid Now” gets things under way with its quiet verses and full-on rock chorus and by the end, Bob’s voice is cracking up under a blanket of warped effects. Epic break-up ballad “Again And Again” finds Bob on compelling form, backed by a wall of acoustic guitars and a mournful cello; it’s possibly the best thing on the album. Elsewhere, “Return To Dust” and “The Silence Between Us” come closest to replicating the sound and urgency of his pre-solo output and, not surprisingly, they are both superb. 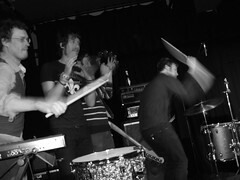 On the downside, “Old Highs, New Lows” is a dull MOR ballad while “Shelter Me” is a plodding techno dirge with lashings of ugly vocoder, an effect that is also in evidence on the excellent “Very Temporary” and the upbeat acoustic pop of “Miniature Parade”, though its use on these songs is much more subtle and it doesn’t detract from them. The album ends with “Walls In Time”, a song that’s been kicking around trying to find a proper home for 20 odd years, which is about as long ago as I last took an interest in Bob Mould’s work. It’s a meditation on the songwriting process and features more multi-tracked acoustics and more mournful cello. It’s a good end to a very good album and, although it won’t necessarily compel me to delve backwards into the Mould solo discography, I’ll certainly sit up and take notice of what he does next. File under bob mould,cd review,CD Reviews,district line,husker du,mp3,Reviews. Contrary to popular opinion amongst my friends (and perhaps anyone who’s read my gushing endorsements of The Decemberists), I bought my first Laura Veirs album, her current one, Saltbreakers, not because she duetted with the lovely Colin Meloy, but rather because a friend whose taste in music I trust said it was a fantastic album. It is. While I had previously avoided her studiously as I thought she might be another one of those boring, faux-quirky female acoustic singers with whom we have been assaulted over the last 18 months, much to my chagrin; it turns out she writes lovely songs that mention water somewhat regularly and that she has a very pleasant, soothing and friendly voice. So, we took ouselves down to the Night & Day expecting a pleasant evening – which is pretty much what we got. 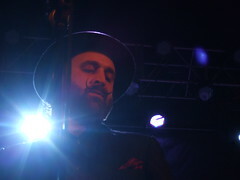 The opening act was Clyde, a singer-songwriter from Seattle who sings in a band called Your Heart Breaks. I listened to a couple of their songs on MySpace prior to heading down to the gig and they were warm, quirky, lo-fi numbers that reminded me of the Moldy Peaches in tone, if not in content. Funnily enough, Clyde mentioned being friends with Kimya Dawson, formerly of the Moldy Peaches. In person she was warm, funny and very self-deprecating and if lyrically some of her songs were a bit lacking, she made up for it with enthusiasm and some very entertaining storytelling. I was smiling when she left the stage and feel like I really should go back to the Your Heart Breaks MySpace page and download a few tracks. We were expecting Laura Veirs to be touring with a full band, as Saltbreakers has a lot of instrumentation on it, but it seems we missed that jaunt a few months back and this time she was on her own, because, she told us, she likes to see how the songs stand up alone occasionally. They sounded lovely, in fact. Despite some problems with her monitors, she put in a faultless performance that even saw a couple of songs on the banjo and some old folk covers as well as a set covering not only her most recent album, but all the ones before it that neither I nor the The Ledge have heard. That is, all her albums except the first one which she reckons is a bit crap as she was still learning her trade at the time. The audience were entranced by her, with a gaggle of young women at the front of the stage singing every word along with her. The only problem, really (apart from someone standing nearby who really needed a stick of deoderant and the omission of “Drink Deep” from the set), was that not knowing most of the songs meant I couldn’t fix on the lyrics very easily and so the overwhelming experience was her voice, which doesn’t really change much from song to song (not that it would without effects which would kind of defeat the purpose of an acoustic performance), and the melodies which started to blend together without the help of a range of instruments to give the songs musical depth and variety. I don’t think this was an issue of songwriting but rather my lack of familiarity with the songs. A full band would have kept my attention better and given me more to hear and see. On the whole, however, Laura Veirs put in a great performance and is clearly a songwriter whose back catalogue is well worth exploring further. 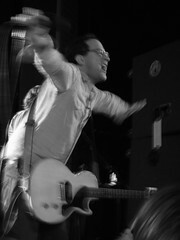 File under female singers,Gig Reviews,gigs,Laura Veirs,mp3,night & day,Reviews,Your Heart Breaks. Fortunately, I managed to miss out on that 30 Seconds To Mars gig that JustHipper went to last week, so this was my first gig of the new year and my first in almost 8 weeks, which must be some kind of record. It was good to get back into the swing of things with what was a pretty decent start to the year. 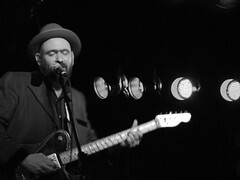 Support was from The Apostle Of Hustle, the band of Broken Social Scenester Andrew Whiteman, and it was easy to hear Whiteman’s influence on the Canadian supergroup in the first couple of songs as his exceptional, and quite distinctive, guitar work weaved its magic. There followed a tongue-in-cheek (I think) tribute to dead rapper Easy-E and an excellent instrumental with Whiteman’s guitar again to the fore. 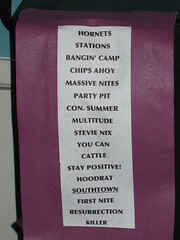 The last couple of tracks meandered a little but overall it was an excellent set. Stars have built up quite a fervent fanbase over the last few years but I can’t say that I’m one of them. There’s no doubt that they produce intelligent, sophisticated pop music, but they are occasionally too slick for me, tip-toeing over into worryingly bland MOR territory. That said, their albums are usually more hit than miss and at the Academy 3 they brought with them mostly hits. 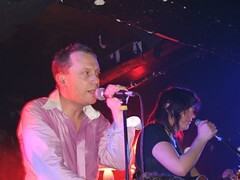 They inevitably began with “The Night Starts Here” and it was great, with its hypnotic repeated melody and interlocking vocals from Torquil Campbell and Amy Millan showing great promise for the evening ahead. Soon after came “Window Birds”, probably my favourite track of theirs and certainly the highlight of the night. Things dipped a little in the middle with the sound mix going to pieces for “What I’m Trying To Say” and a version of “Personal” that did as little for me as the album version does. “The Ghost Of Genova Heights” fared a little better, benefitting from the rough edges that a live performance lends and getting me thinking that it is perhaps a little more than just a rehash of “The Night Starts Here” with added Bee Gees chorus. It has to be said in mitigation that during this middle section of the gig my attention was occasionally diverted by a couple of drunken dickheads who pushed their way through the crowd til they got next to us and royally pissed off everyone around them, especially JustHipper who ended up threatening physical violence. She does kickboxing now, so beware. Stars pulled out the big guns at the end, with a run of much of their best material, including “Your Ex-lover Is Dead” (possibly the best song The Delgados never wrote), a quite brilliant “Take Me To The Riot”, and an epic closer in “In Our Bedroom After The War”. I doubt I’ll ever be a fully paid up member of the Stars fanclub but they are an exceptionally enjoyable live band with plenty of good songs and I’ll doubtless be down there next time they come to town. File under apostle of hustle,Gig Reviews,mp3,Reviews,stars. In what is possibly not an auspicious start to the gig-going for 2008 I attended my first emo gig since about 1996 (back when emo bands played church basements full of straight-edged teenagers and didn’t wear eyeliner), using a spare ticket that Bricking Chick had for 30 Seconds To Mars, the band fronted by none other than Jordan Catalano out of the TV show My So-Called Life. Most of you probably know him as Jared Leto. Having only a vague idea that the band play some sort of predictable emo rock, I was, I must admit, tempted enough by the notion of being able to gaze up at the rather nice looking Mr. Leto that I completely forgot about the last time I saw a rock band fronted by a Hollywood leading man – Keanu Reeves and his band Dogstar who were the laughing stock of Glastonbury in 1999 because they were so abysmally awful. This was nowhere near as bad as that Dogstar performance. Thank goodness. For starters, Jared Leto can actually sing. In fact, his voice reminds me a lot of that of Ed Kowalczyck of +Live+ whose first two albums are pretty good. 30 Seconds to Mars are actually pretty competent musicians who do a very good job of entertaining a crowd. While the songs were pretty derivative and the set contained far too many ballads, their music was in no way offensive or off-putting. It just wasn’t particularly memorable. On the whole, though, I liked the louder songs well enough and was somewhat amazed by the fact that this was more of a “rock” show than the Marylin Manson gig I attended back in December (which really was just theatrical pop). The only real downsides were the fact that we couldn’t get close enough to the stage to really see the band and the between-song banter which was just pathetic. Apparently a song which Bricking Chick informs me they wrote two years ago is actually about their trip to China they took last month which was, it would seem, “life-changing.” Whatever. The highlight of the night was not actually the band, though, it was the teeming masses of 15-year-olds who were in the crowd (whose parents were queuing to collect them at the end of the night). They were brilliant. They were enthusiastic, they were screaming like the girls in those old videos of The Beatles, and I swear that the four girls in front of us, kitted out not only in 30 Seconds to Mars T-shirts and hoodies but also bags and wristbands, were crying at one point. Maybe the choice of band is a bit poor, but hopefully with that enthusiasm for their music in a couple of years they will have developed a taste for something a bit more challenging and unusual. The fans of today’s manufactured rock may well be the people buying records by the next At the Drive-In, Trail of Dead or even Mogwai. So, musically, not as good a beginning as 2007, but still a hopeful start to 2008. File under Gig Reviews,gigs,hollywood film stars who sing,jared leto,manchester academy 1,manchester gigs,Metal Mayhem,Reviews.